Dan, Dan the Birthday Man! Well it’s January 15th again and if you are a long time reader, then you know that it is Dan’s birthday! I have already sent my birthday love (see this post to know what that means.) However, I am not sharing them like I did last year. This year I’m doing something a little bit different for the public arena. I decided to use my skills, or lack thereof, and express my love in Multi-Media Slideshow Delight. So here you go Dan. I love you so much, that I spent all day in my Jammy Jams creating this just for you. The music is My Best Friend, by Weezer (best band ever fyi) No copyright infringement intended, just some birthday love. Happy Easter. Here is a beautiful video to remind us what it is all about. Let us stand by Him as He stood, and continues to stand, by us. I know what you have been thinking. I am sorry, I did make you wait. However the first one, Post At Least Once a Week, was self explanatory. The second one needed a little background and my last post provided that background. Do you need a reminder what my second New Years Goal is? 2. Learn how to remain calm, even in stressful situations. Why did this goal come about? Why did I need to post about getting a dog before I addressed this goal? Is two plus two four? Yes, my sweet little Kona, that I love, required me to learn a little something about myself. I am in fact, not so calm as I thought I was. Part of the deal of getting a dog, beside the top two rules I mentioned (and threw out) in the last post, was said dog must be well trained. Lucky for us, Kona came that way. I wanted to make sure she stayed that way. I noticed that while she started out very easy going and a good listener, she was slowly starting to get a little naughty. I asked my vet if he could recommend a good trainer and he surprisingly said no. He recommended that I just watch this guy. 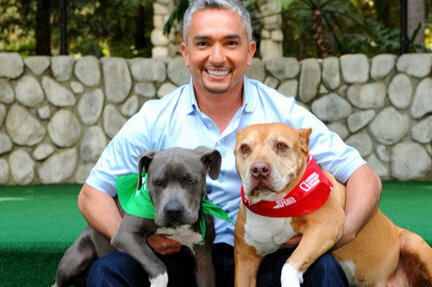 Yep, that’s right, the Dog Whisperer himself, Cesar Millan. I am an Obedient sort of person, so naturally I ordered every DVD on Netflix and got to work. If you have watched even one episode then you know that Cesar Millan puts strong emphasis on the type of energy you give off. When owning a dog you should be Calm and Assertive. There is also a lot of other great stuff on there that I don’t want to go in to, but we are implementing them. I started noticing a difference right away in the way Kona acted…with Dan. She became more obedient…with Dan. She did well on the leash…with Dan. See the pattern here? I was doing everything the same as he was, but for some reason I was not getting the same results. Don’t get me wrong, Kona wasn’t behaving badly, she just was starting some bad habits of not listening, that I wanted to nip in the bud. I noticed this energy thing that Cesar talks about over and over and I asked Dan if he does that. Does he imagine himself as the king of all that is around? Does he focus on being calm and assertive. I asked him who he imagined he was to help him feel that way. I wanted to get into Dan’s brain. (Good luck with that one.) Here is his response in typical Dan fashion. That is when I realized I needed to Tune in to Tannie a little more. I was doing everything that Dan was, except for the whole confident, calm assertive energy thing. I THOUGHT I was a calm sort of person. It turns out…not so much. I took some time to truly look at myself and analyze the way I was feeling. The majority of the time I am pretty hyper. Or frustrated. Or exhausted. Or stressed. Or Stressed. OR STRESSED. I discovered that I spend A LOT of time feeling stressed. When did I get to be that way? It seemed like it was just a habit at this point. Like a secret favorite feeling that I started wrapping myself in. So it was time to let go. At first I did it just so I could become the pack leader to my dog. However, my focusing on being calm with the dog soon became my noticing all the other areas I needed to practice being calm. I had never noticed how much I needed it in the rest of my life. You can’t try to improve in one area, without it effecting other areas. So it was time to make it a Goal. Well it is true. I am pretty good at being that way on the OUTSIDE. The inside is another story. And only a Dog was able to point that out. You can’t fool a dog as to what is going on on the inside. Kona knew I was stressed and less confident inside. So she was not having any of it. No matter how confidently I walked, or spoke to her, she knew the truth. So here is to a 2013 Tannie that is Calm, Cool and Collected on the outside AND the inside. Thanks Cesar Millan, turns out you might be a people whisperer too. Happy Wednesday all. We are mid week and feeling good! 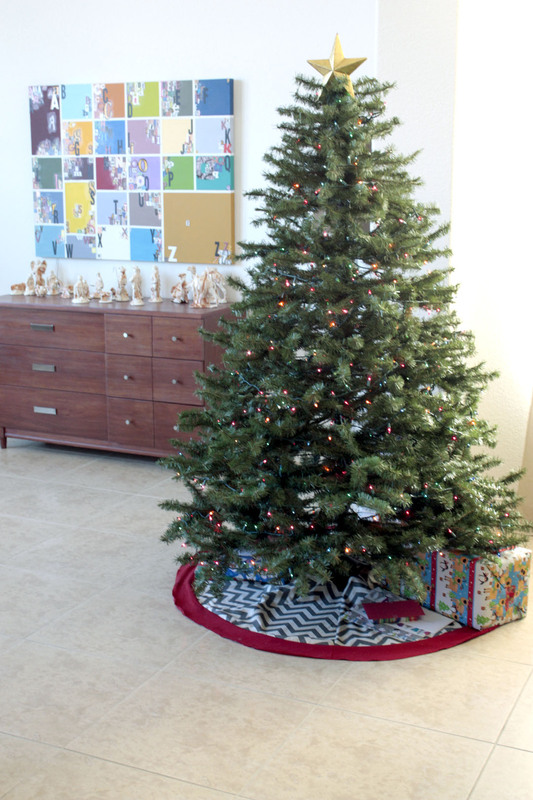 If you recall from this post, I promised a tutorial on that tree skirt. I know it is pretty much after the fact (the fact being Christmas of course.) But I am still going to provide the tutorial. Just Pin it and save it for next year! 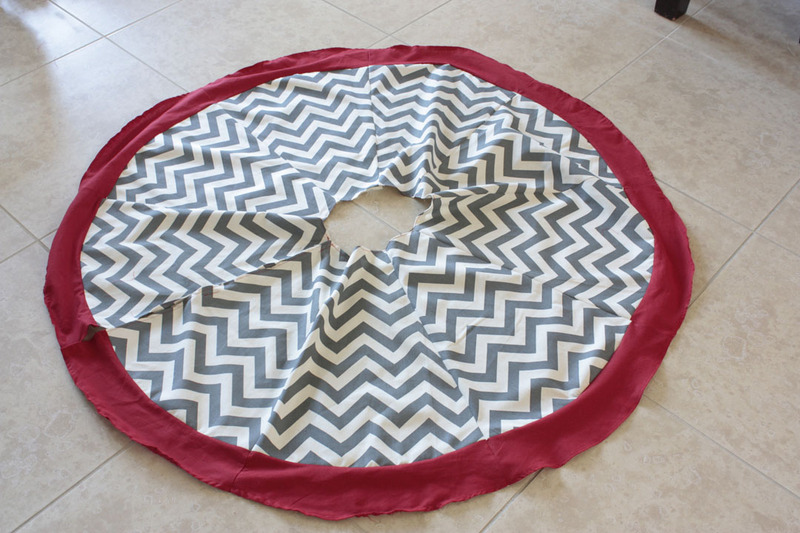 When I pinned it, the text read “Chevron Tree Skirt Tutorial.” However when I followed the link over to Project Run and Play, I discovered that it was NOT in fact a tree skirt tutorial, but a circle skirt tutorial. Like to wear…for people. Not trees. My first thought was, no problem, I will just adapt it. However I felt that the directions seemed a little time consuming for what I had in mind. Perfect for a skirt you might wear frequently, but not perfect for something you get out once a year to sit on the floor. So rather then adapting, I decided to just do my own thing and make it up as I go. 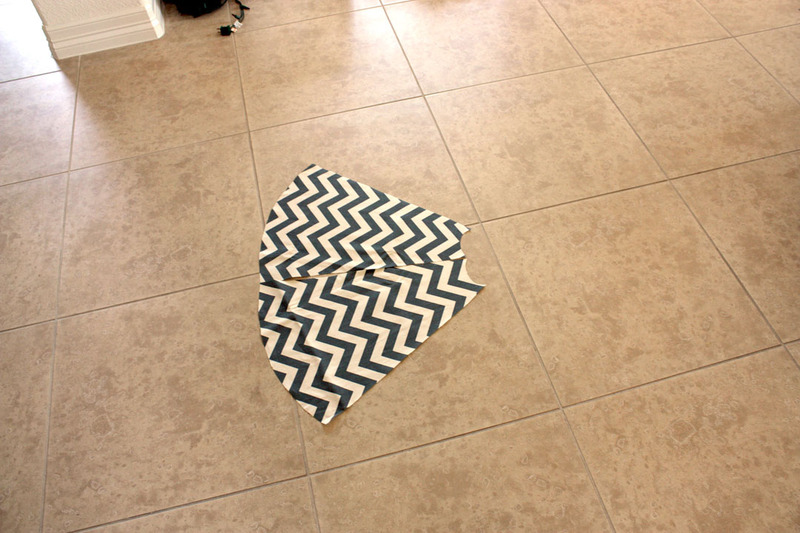 So here is my, FOR REAL, Chevron Tree Skirt Tutorial. As established in my Christmas Tour Post, I was going grey and red this year. And probably will for the next few years. I am not one to mess with what works. 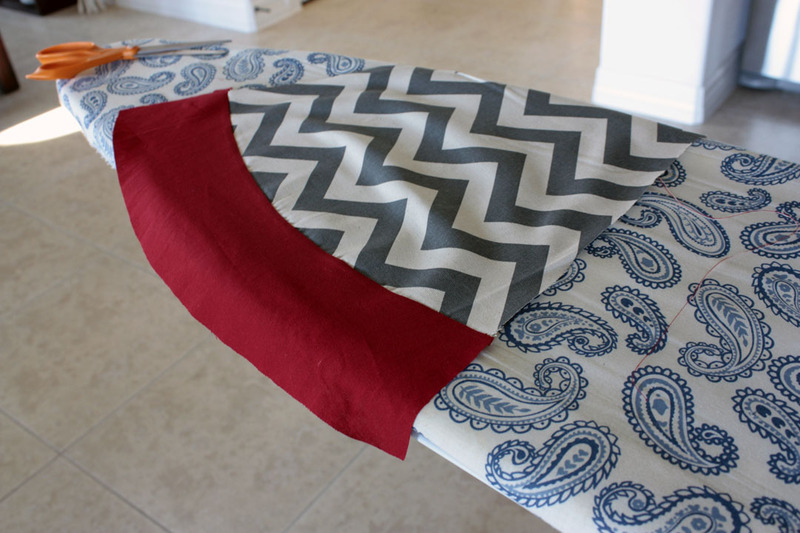 I happened to have some leftover fabric from some pillows I made. Lots of fabric, but no pattern. 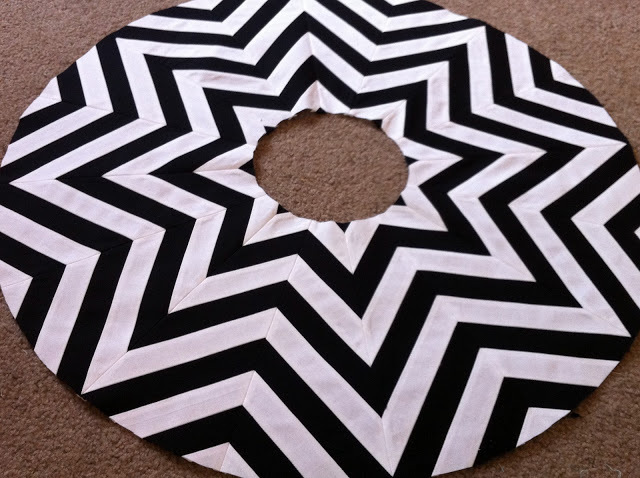 So I decided to grab my old tree skirt and make one. 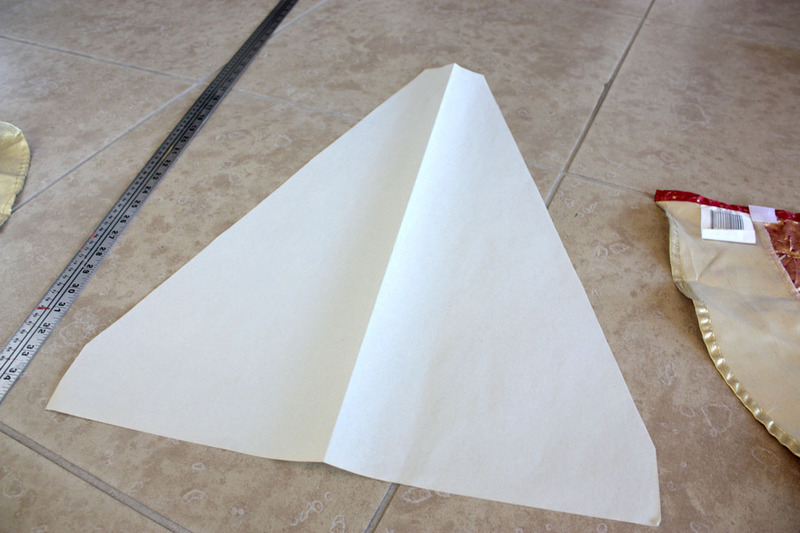 I measured, and folded until I got something that looked like this. This gave me the basic shape I needed to work with. 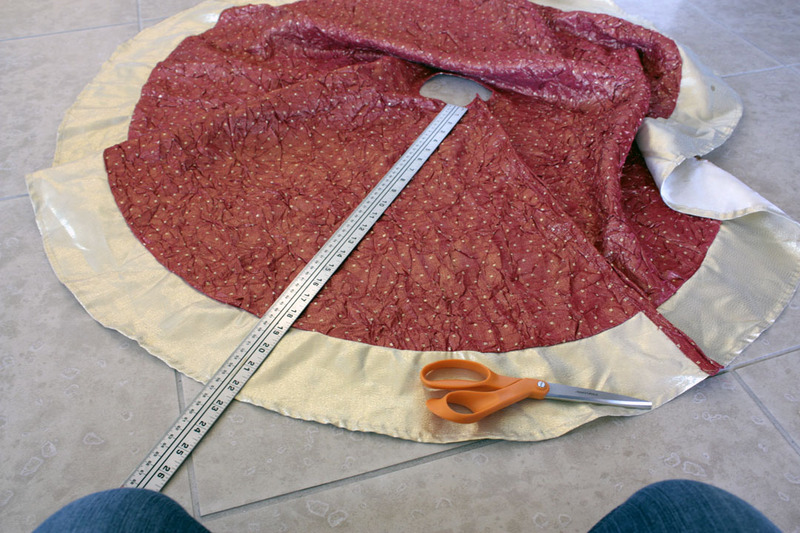 And since I was never going to use this skirt again, I went ahead and cut it down to size. 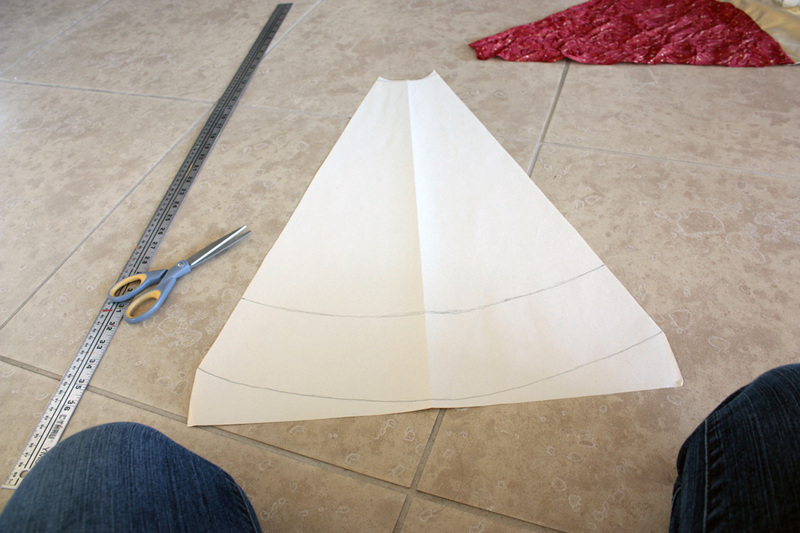 Once cut, I set it on top of some newsprint that was to be my future pattern. I knew I wanted the grey chevron on the inside and the red solid on the border. 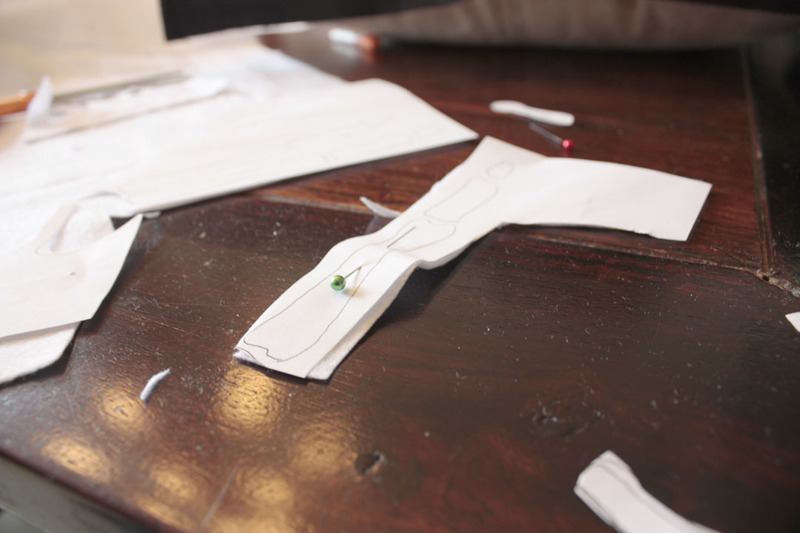 So first I traced the material and cut out the general shape. 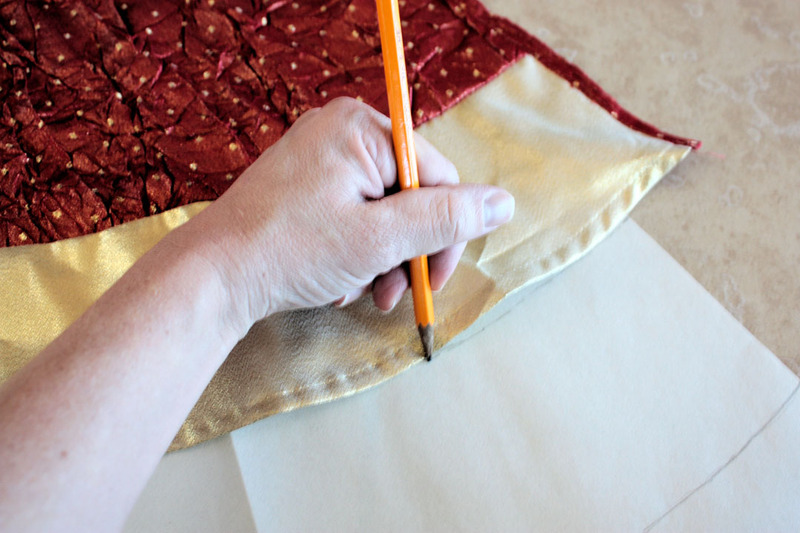 The I used the original fabric as a stencil to mark where the border and the top come in. Voila! I know had a pattern for the inside, and the border. 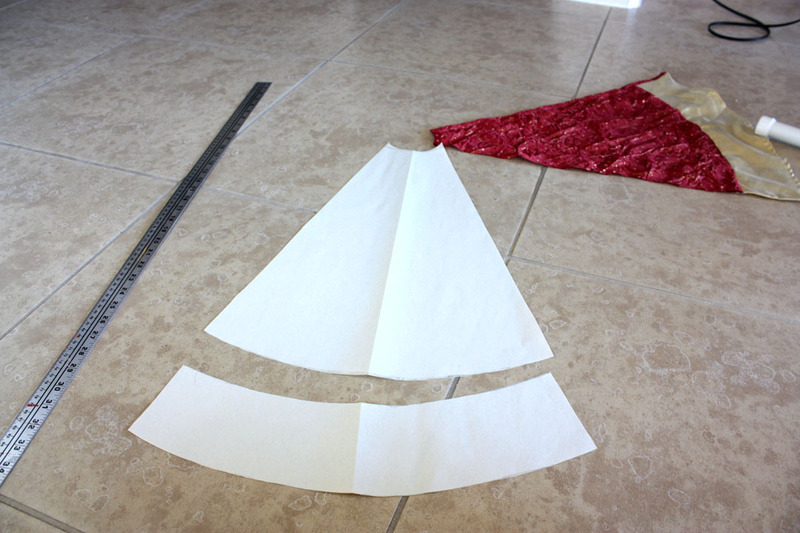 I set aside the small half circle shape and used the large cone shape first. I needed to make sure each section looked the same. In order to do that I lined up the center of my pattern with the down line (I am sure there is a better word for that) of the chevron. 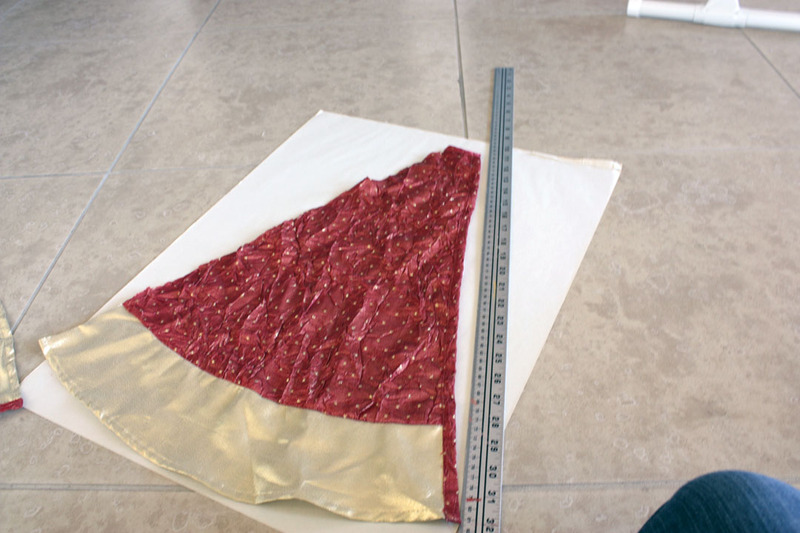 Then I pinned it in place and cut away. Working with chevron was tricky. I had to use more fabric then I thought, because of the pattern. One way to offset that was I would alternate the direction. 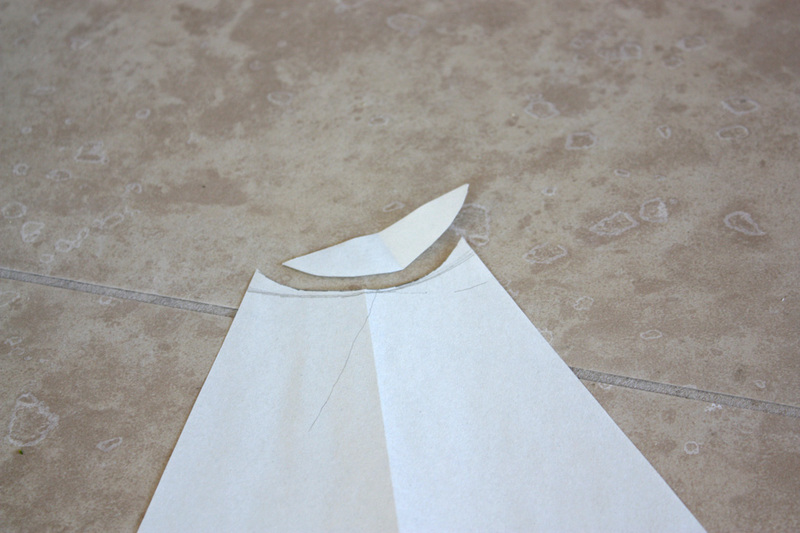 So if I cut one panel with the small end of the pattern at the top, then I would cut the next panel with the small end facing down. That way I could take full advantage of the material I had. Does that make any kind of sense? Now time for the Red. 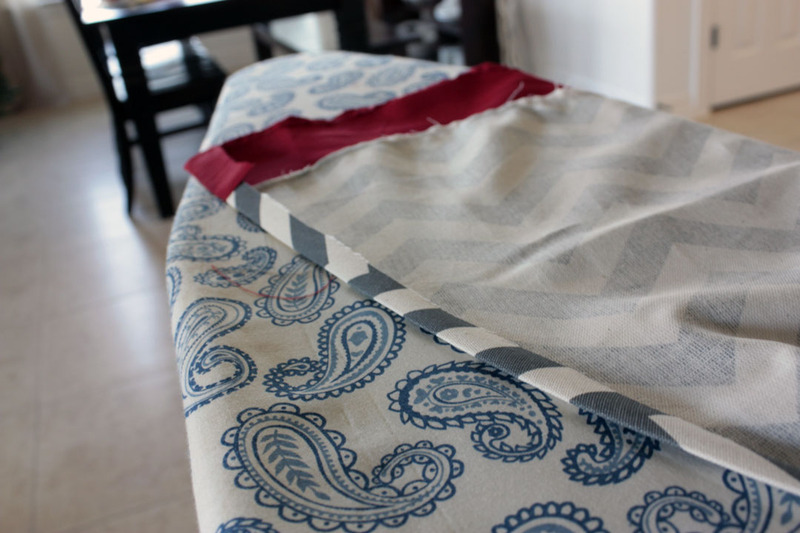 This time I folded the fabric several times before pinning. That way I could cut more then one section out at a time. 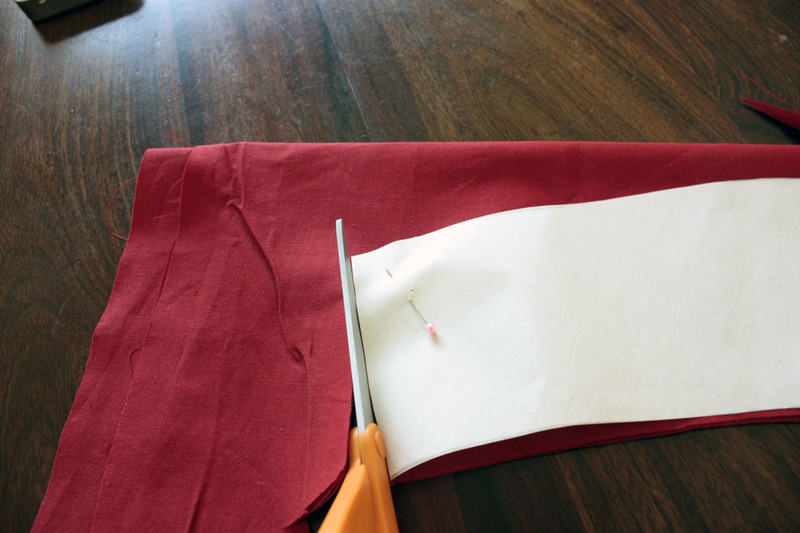 Once those were cut out, it was time to sew, sew, sew. You know what that looks like right? Well I hope so, because I couldn’t take a picture of myself doing it. 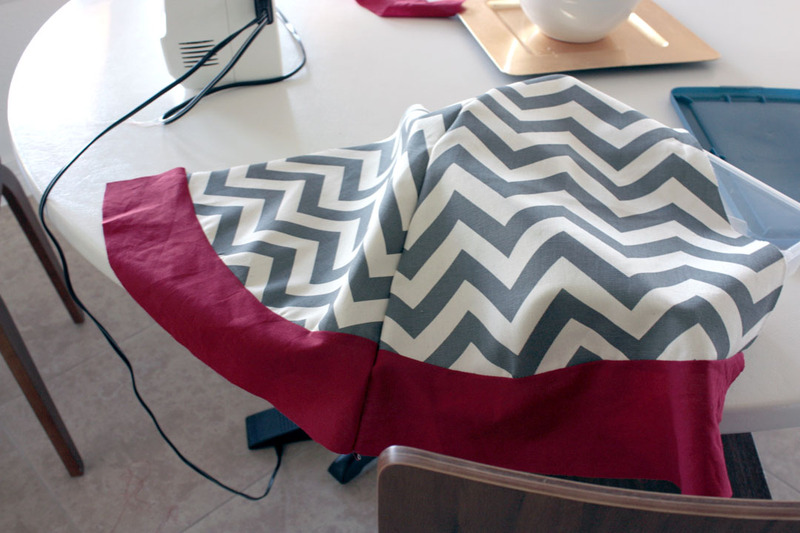 First I sewed the red panel to the chevron pattern. This was tricky since there is a curve involved. But I found that if I just treat it like a straight line and go super slow, it works just fine. 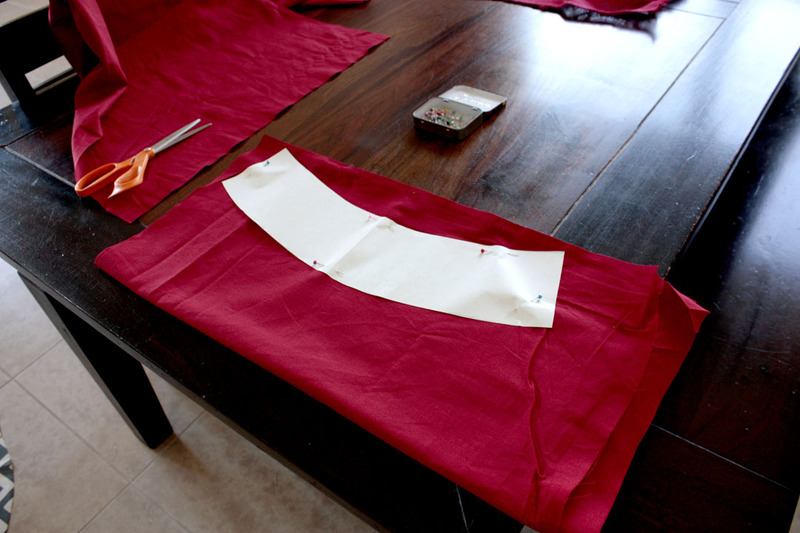 Once the two colors were together I began sewing the panels together. I would take two panels and lay them on top of each other, pattern facing inward. Then I just kept on keepin’ on. 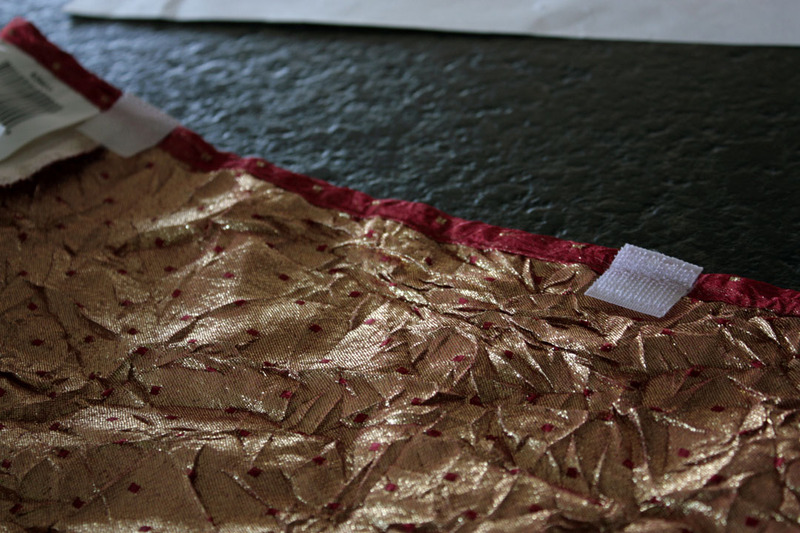 Soon I had all 9 panels sewn together. 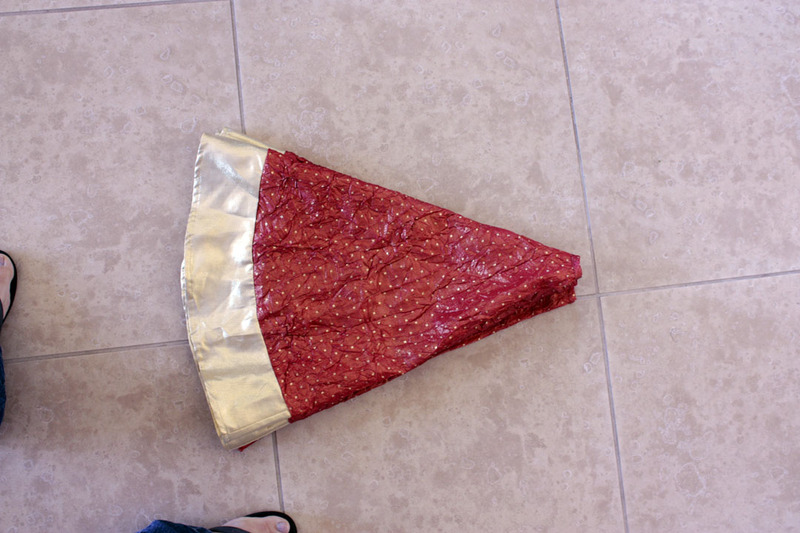 However remember, it is a tree skirt. So I did not connect the front and the back. That is left open in order to go around the back of the tree. Next I seemed up all the edges using the ‘ol turn and flip that I show here. 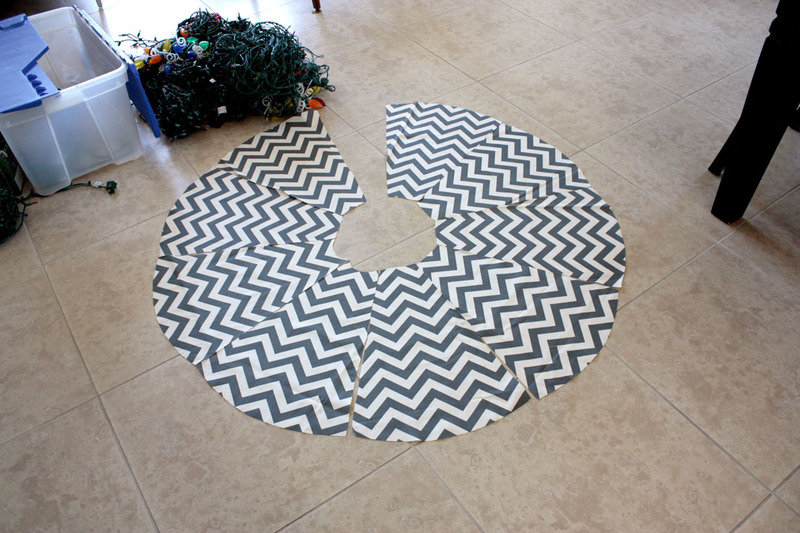 Then I stole the velcro from my old Tree skirt to use on the new one. Then Ta Da! 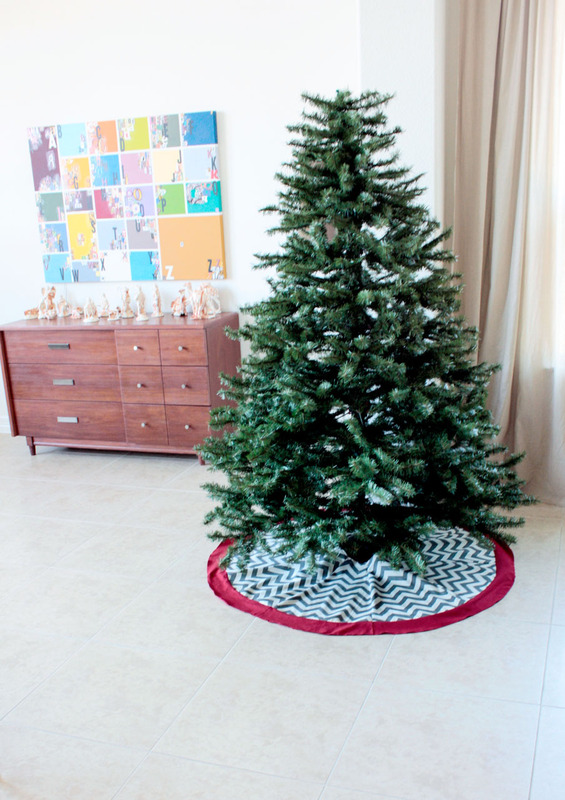 A tree skirt was born. I was pretty happy about it, especially considering how I literally just made it up in my brain. I will be honest, it most likely can be done better. I would not do a super close up inspection of anything. But for what it is, it totally works. Hope you enjoyed it and maybe will want to try it for yourself next year. 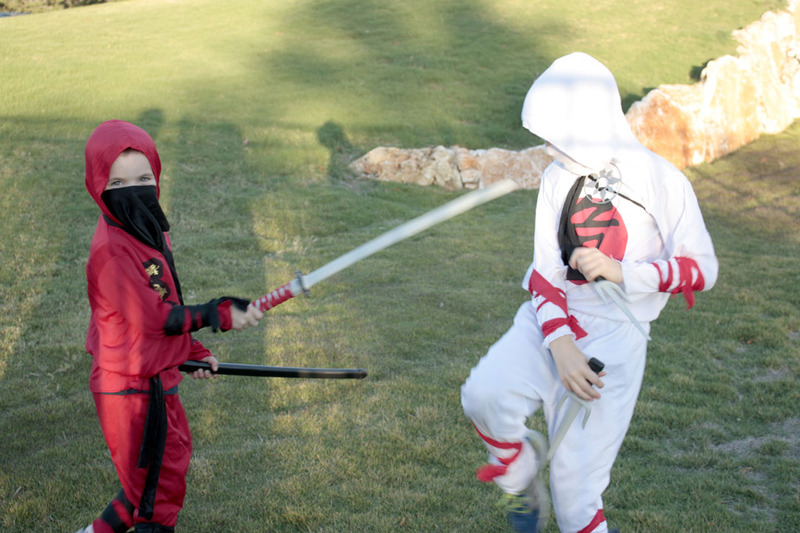 The Smiths had a great Halloween! 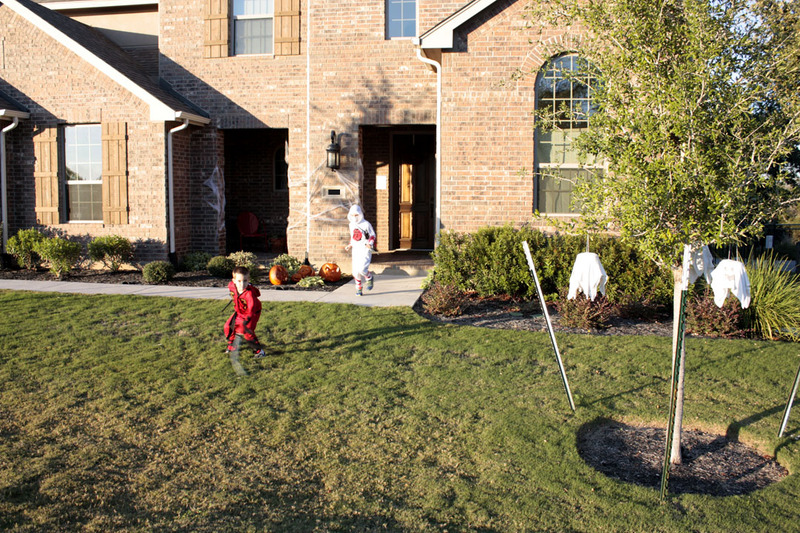 This is our first Trick or Treating in our new neighborhood so we were excited and anxious to see how the neighborhood does. I will let you know now that it passed! At least as far as the candy horde goes. More on that in a minute. However, we were a little light on receiving any ghosts or goblins at the door. I guess we are still too new to the street. 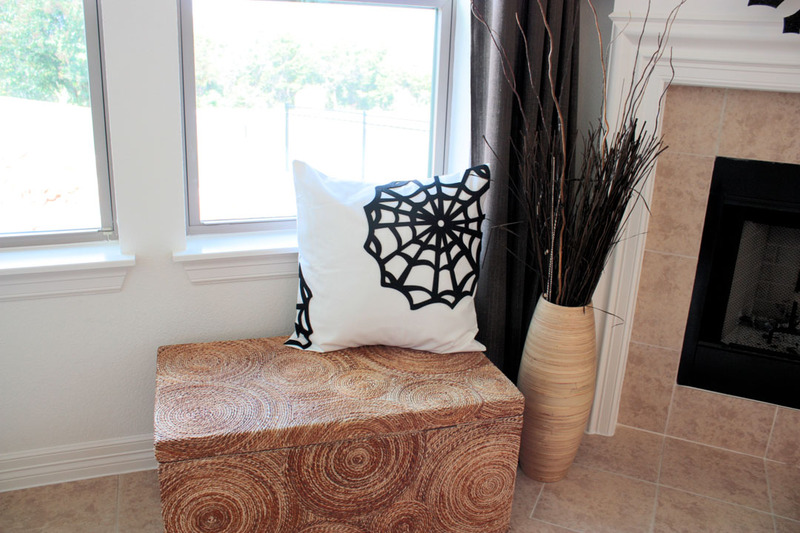 Resolution: Amp up decor next year in order to lure more trick or treators! Well lets take you through the rounds shall we? 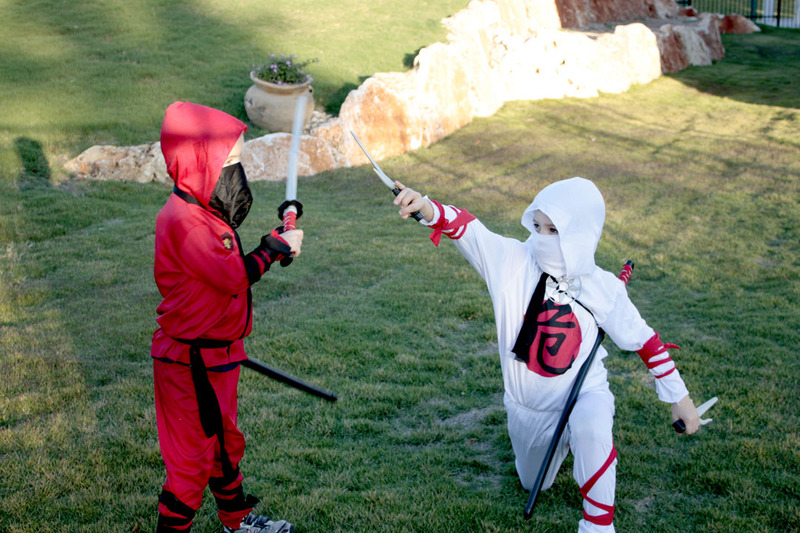 First we had some stealthy Ninjas sneaking around. 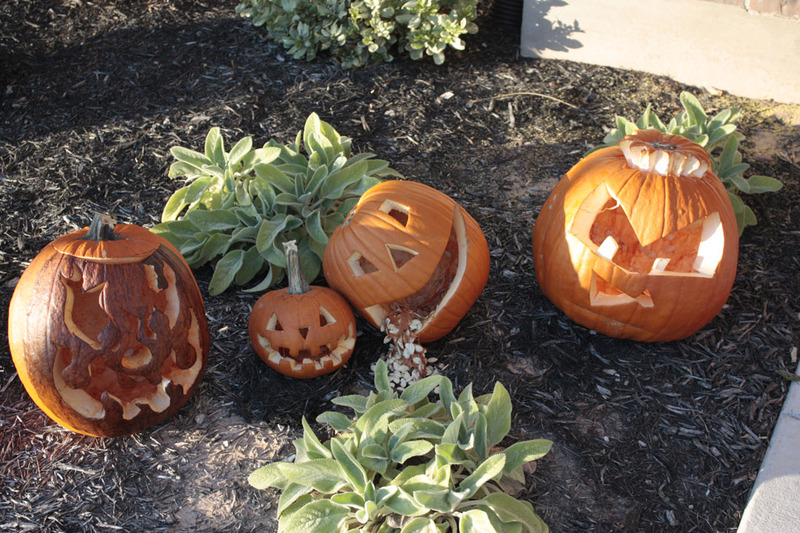 Then we set our Pumpkins out with care. 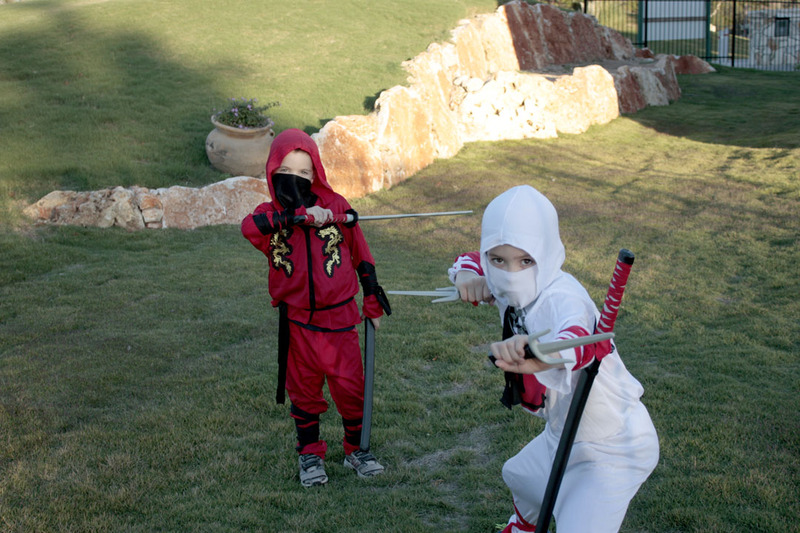 From left to right we have, Dan’s Flame Face, Logan’s Happy Guy, Mom’s Dizzy Sick-o and Austins Anime Ninja. Time to prep and see if we are ready to go. 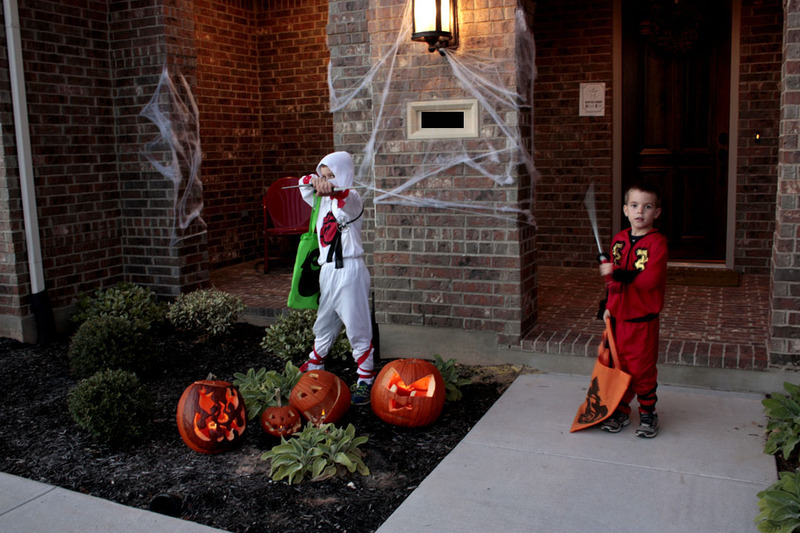 Time to light the Pumpkins and Collect some Candy! 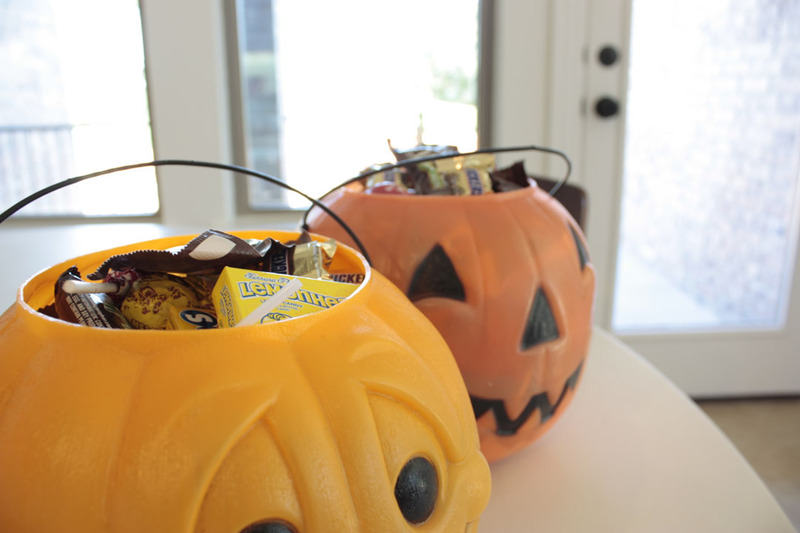 And collect Candy we did! There it is folks, The Candy Horde. Yep, filled to the brim. 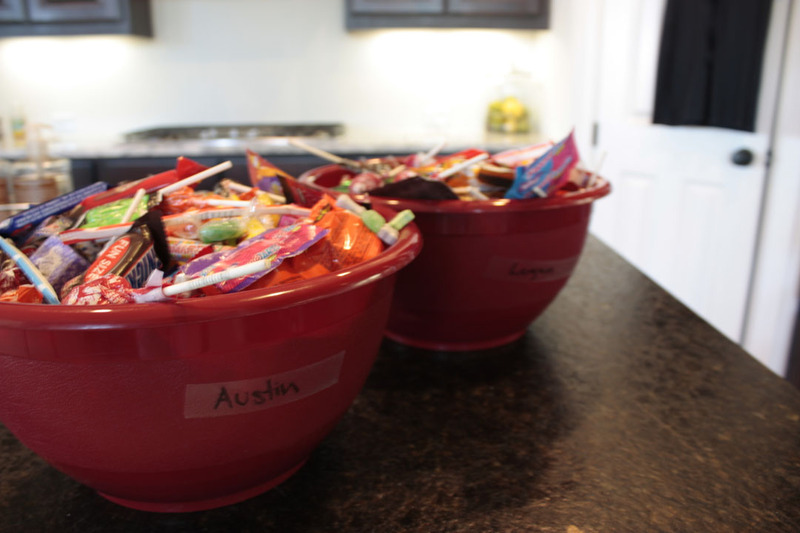 I was hoping it wasn’t really as bad as it seemed, so I transferred the candy to some mixing bowls. Actually The Smithocracy Rule dictates that candy is allowed for one week. Then once that week is up the rest goes away. We usually find someone to give it to. 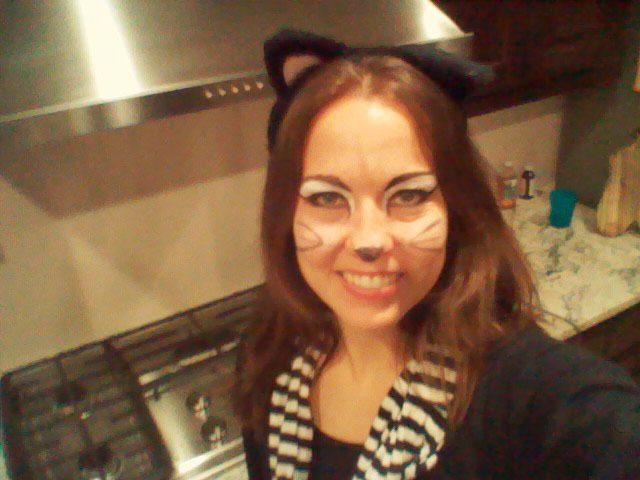 All in all, a successful Halloween! In full transparency, I cannot handle decorations up a day more than they need to be, so everything has already been taken down, boxed up and put away. Time to think about the next holiday and I will share pics once that is complete. Hello! I am back from the good ‘ol city of San Fransico. My brother got hitched and I can’t wait to share all about it. However I will wait another week on that, as we have one more reception to get through. 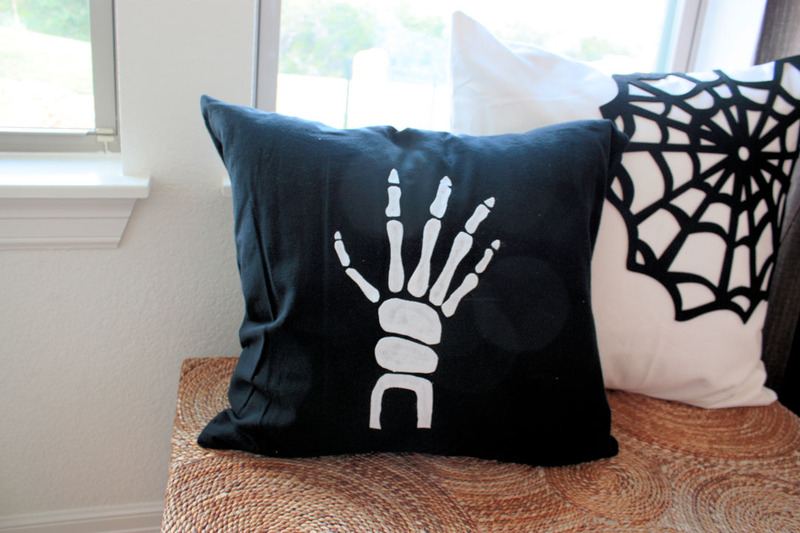 Meanwhile lets make some Halloween Pillows shall we? Last week I showed you around the house in this post. I made a promise at that time, and now I will follow through on that promise. See in The Smithocracy, all Smithocrats come through on their promises. My favorite and easiest way to spruce up for the Holidays, is to use slip covers on my current pillows. As seen here. It is easy and quick to do. Plus it saves on storage space. 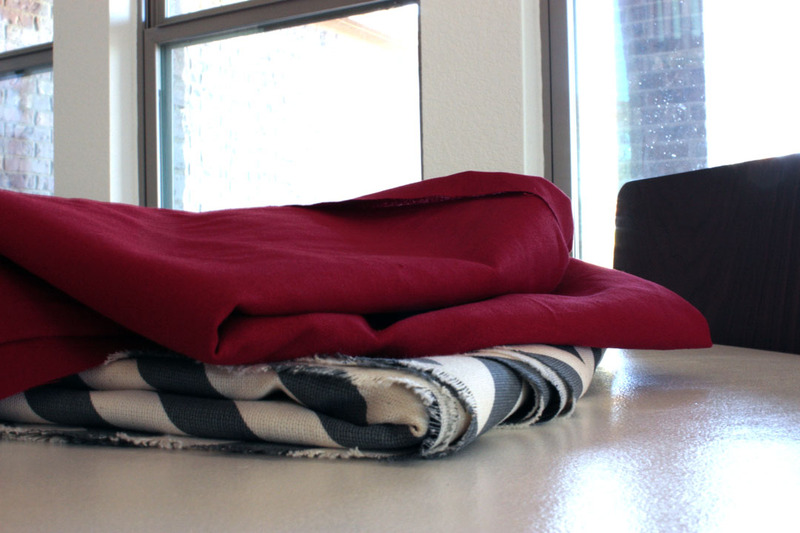 Rather then keeping a bunch of pillows around, I just remove the slip covers and fold them up till next time. 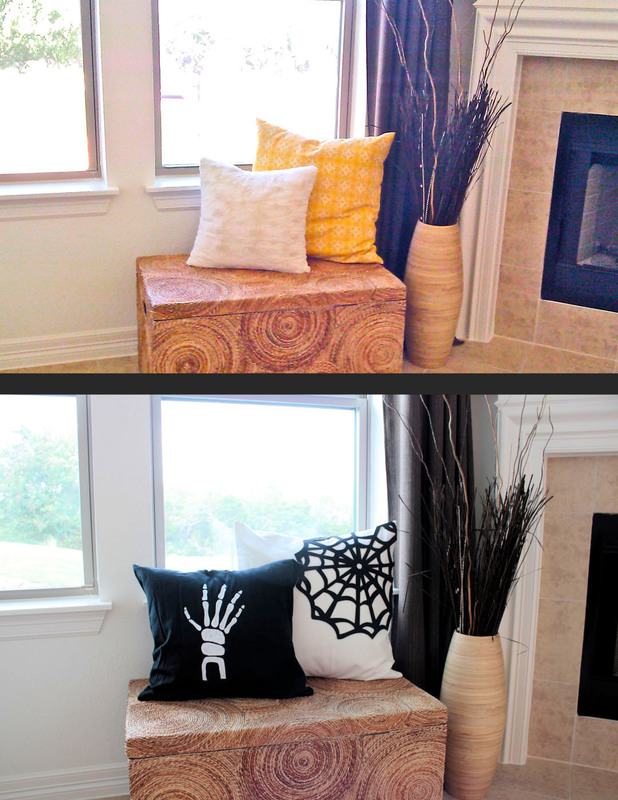 So I made three pillows this year for Halloween. Actually 4, but I am only going to demo three. 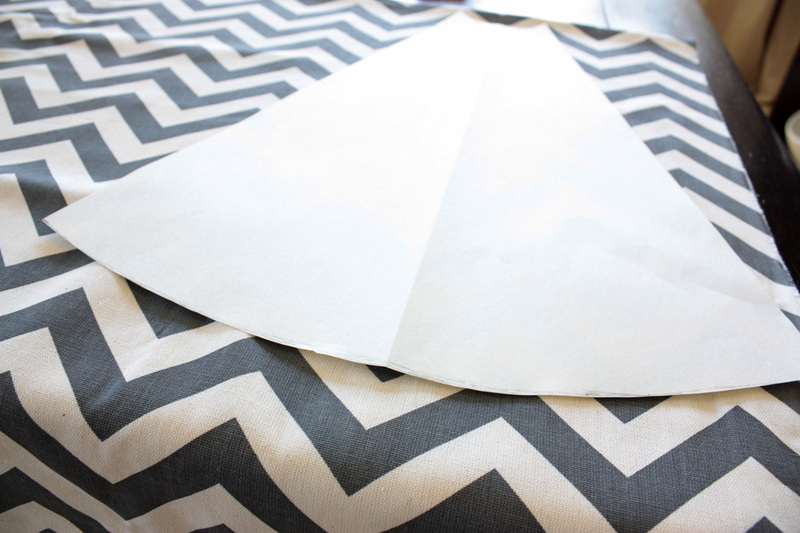 The 4 is the Chevron pillow you see below. 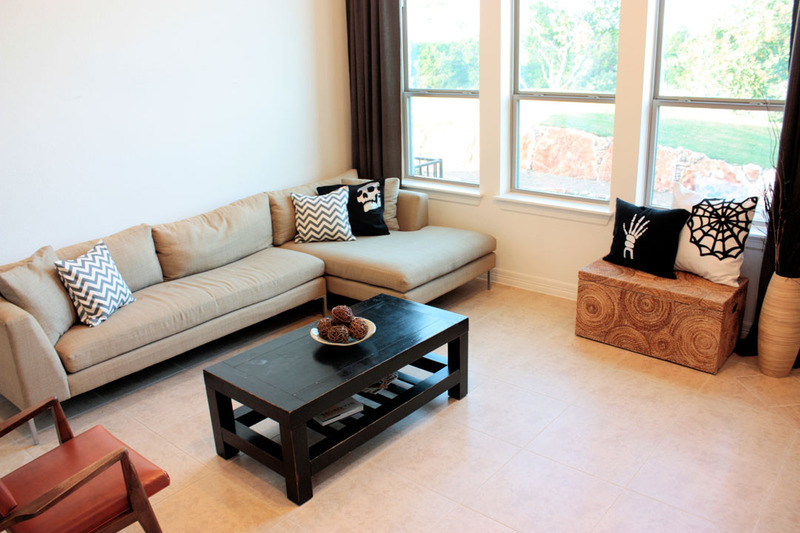 It is just fabric, no decor. Each pillow was sewn using the tutorial I gave here. So I am not going to explain that again. 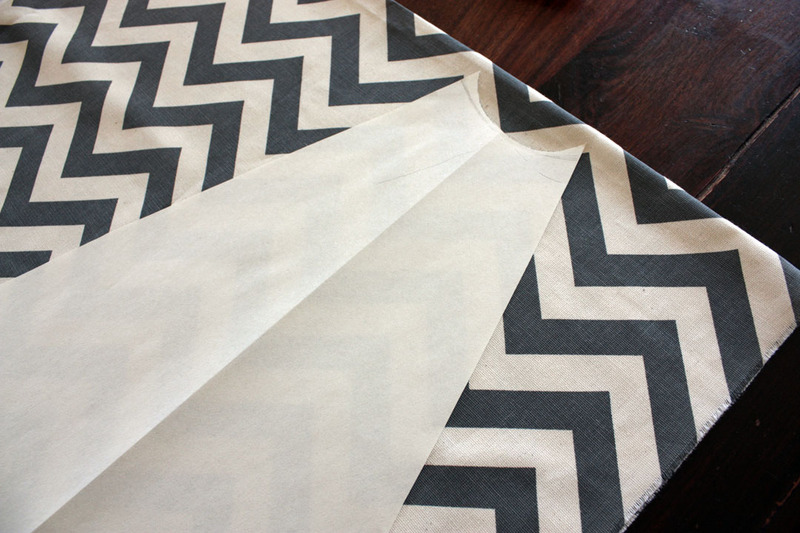 For the benefit of the tutorial I am assuming you have already chosen the material and sewn your slip cover. You are now ready to decorate it Halloween Style! Shall we begin? I used a white canvas for the material of the slip cover. It is super durable and I liked the corduroy like texture. I gathered my supplies which included the items below. Web Felt Charger from Target. I was so excited to find these chargers! 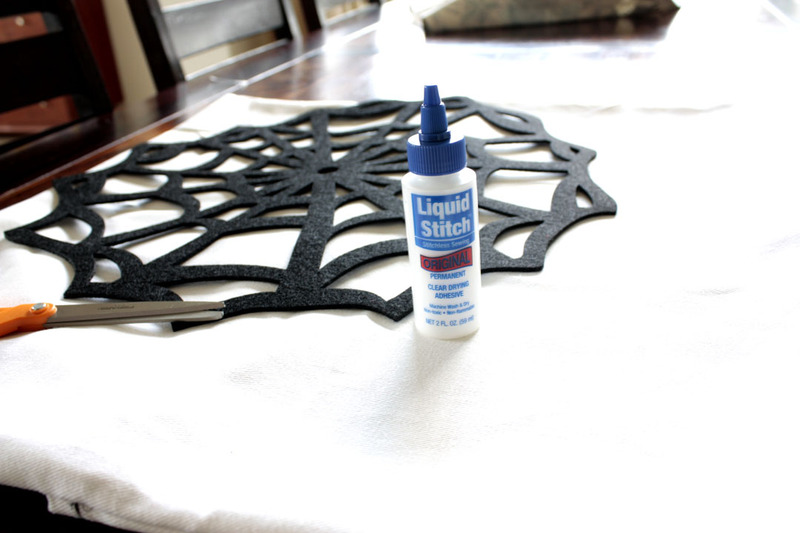 My original plan had been to find some black felt and cut out my own web. That would have been a huge pain, but I was willing to do it. However, the second I saw I could skip that step I jumped on it! First I placed the Charger on my slip cover and cut it down to size, like so. I then used some parchment paper to line the inside of the case. I was not sure if the glue would seep through or not. 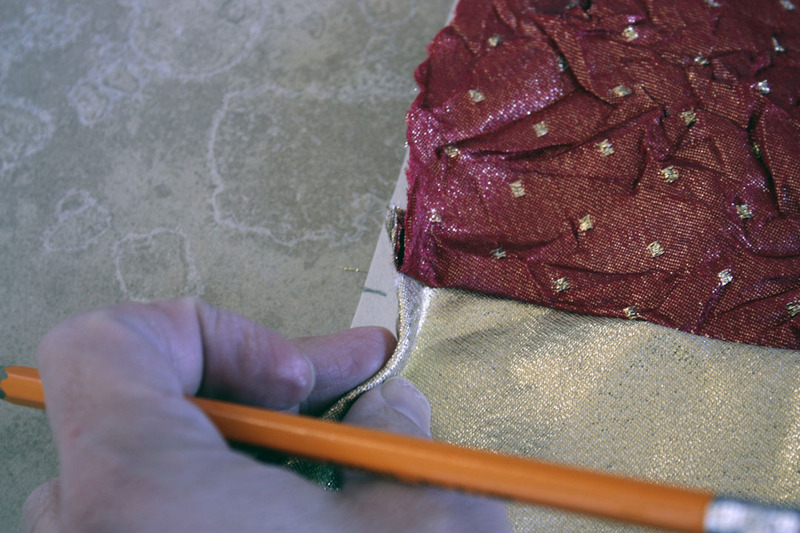 Then I covered the back of the felt charger with the liquid stitch and used my finger to spread it around. Once that was done, I pressed it down into place. It grabbed rather quickly, but I still pressed it down really well just to make sure. Once I felt confident it was on there good, I set it aside to try. There was a tiny scrap left that I glued on the bottom corner and TA DA! I am done! I used a flannel material for this project. For the pillow and the hand. I wanted this one to be soft and fuzzy. 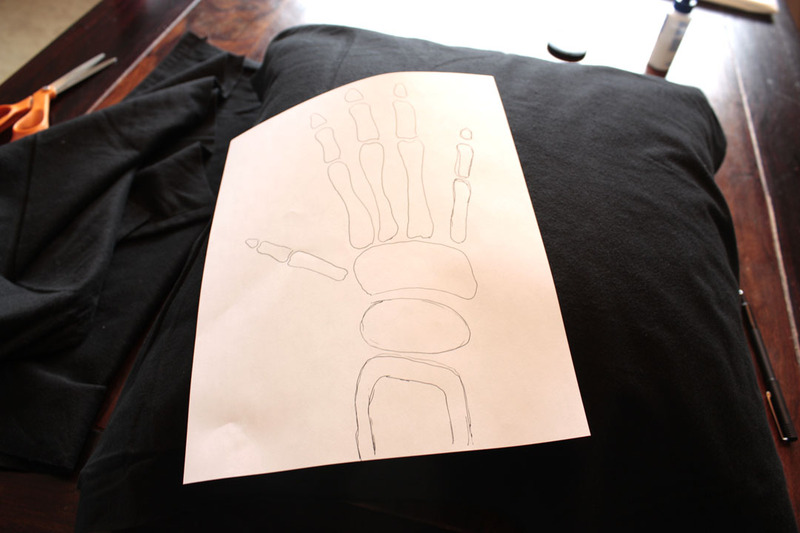 Supplies were the same liquid stitch, some white flannel and a skeleton hand stencil I sketched out on paper. 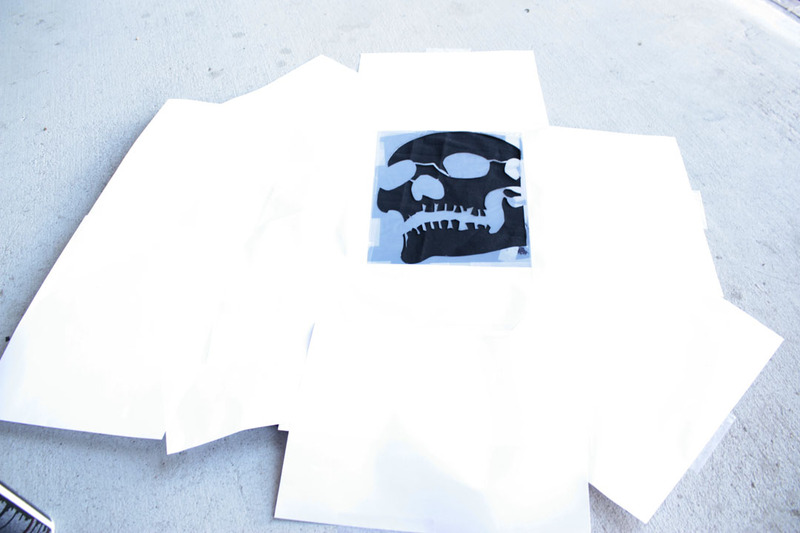 Using the paper as a stencil, I cut out each piece individually. This is why I don’t have a copy to share. Sorry!!! All cut up now. To keep track of the pieces I assembled the hand as I went. Then I used the liquid stitch again and glued each piece in place. Again I lined the pillow case with parchment paper. Only a little dry time and that was done as well. I was bummed that the hand covered the smaller web on the other pillow, but I got over it. Just something I didn’t think about in the planning stages. Oh well. 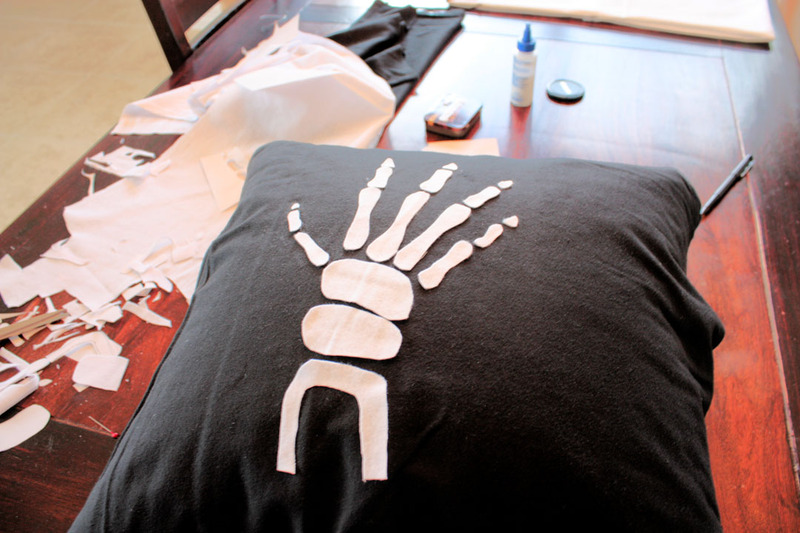 This pillow was easy because I already had the stencil from this project. Many people mocked me for using an actual stencil blank rather than freezer paper. However, this post justifies my actions. 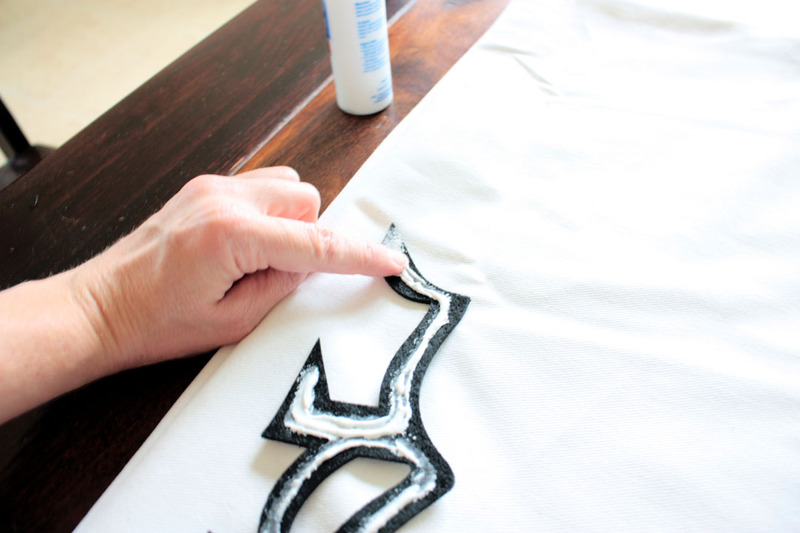 :-) I use this stencil a lot, so freezer paper is a no go for me. 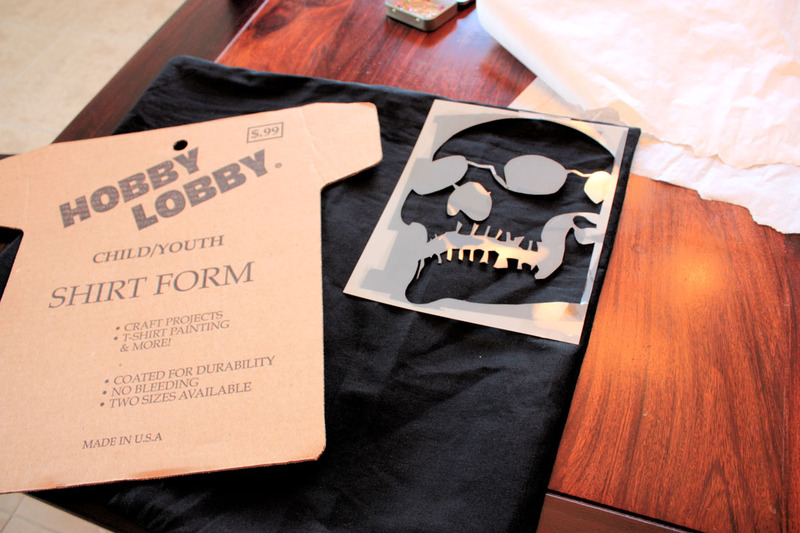 Here are the supplies The stencil, the shirt form and the slip cover. I also used some silver spray paint, but the picture did not turn out. This slip cover, I made from a linen type material. I wanted a rougher feel for this guy. Then I inserted the shirt form inside, to protect from seepage. Any thick material will do, I just happened to have this one on hand. I placed the stencil on the slip cover and took it outside for the rest. 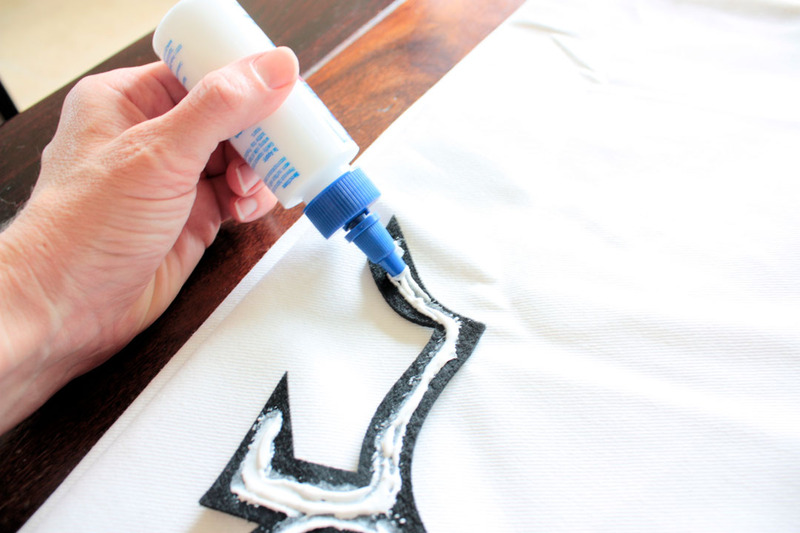 **HINT** use a light spray adhesive on your stencil to help it stay in place. This also prevents clouding. 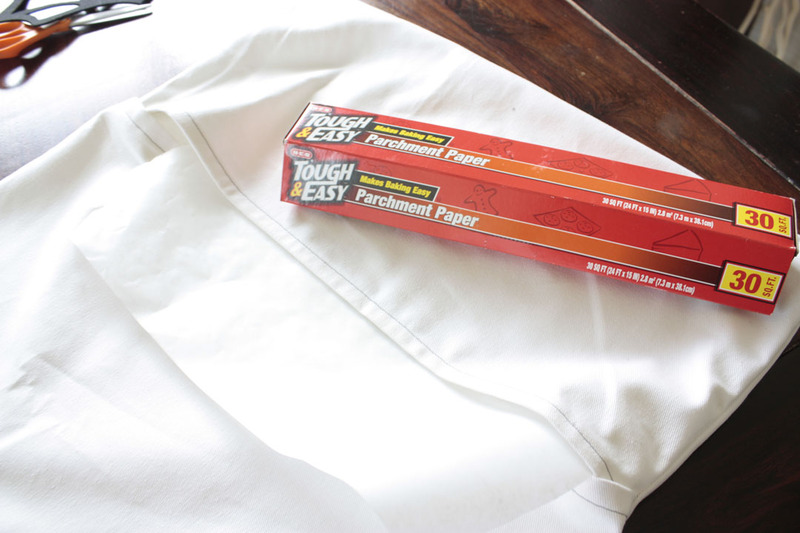 Make sure every inch of the fabric that you don’t want sprayed is covered. Otherwise it will get some spray dust on it. 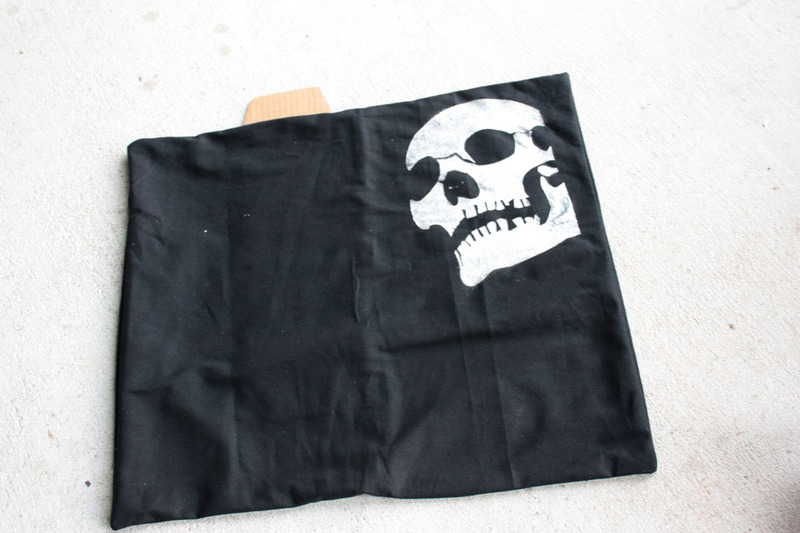 This time I used an actual t-shirt spray paint. I have used regular spray paint in the past and that works just as well, as long as it is glossy. Any other spray tends to wash out. Done! 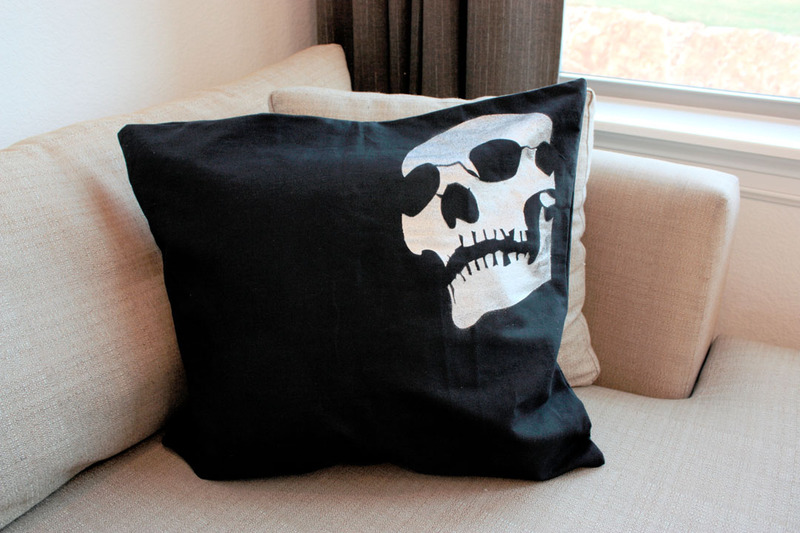 A new skull pillow for my couch. 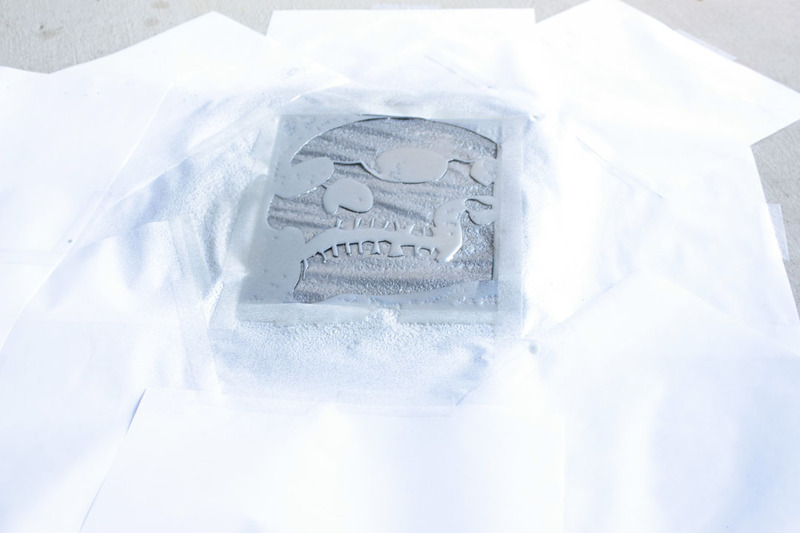 If you want to make this one you can get a skull template from this post. The skull and template were designed and made by me. 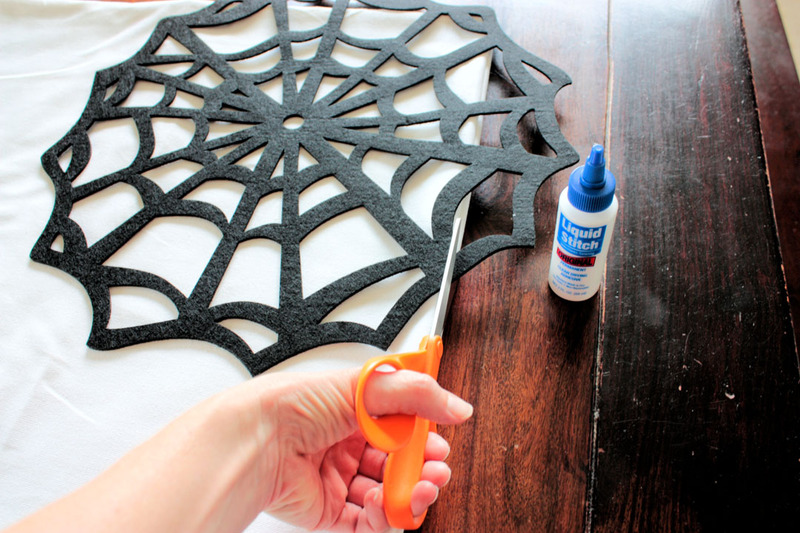 So there you go, some fun and easy ways to make your house a little more Halloween fun. Let me know if you try any of these! Good luck!